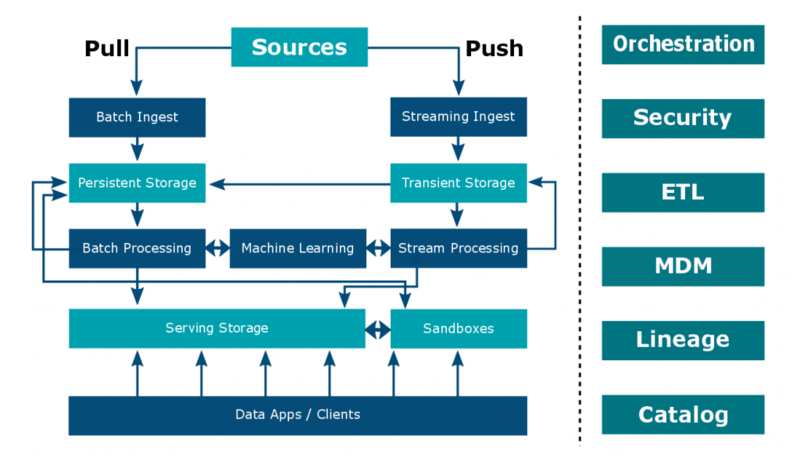 Below is a representation of the big data warehouse architecture. I won’t go into the details of the features and components. If you want to find out more about the gory details I recommend my excellent training course Big Data for Data Warehouse and BI Professionals. So how do the components of the data warehouse map to the various services and products that are offered by the three most popular cloud platforms: Microsoft Azure, Google Cloud Platform, and Amazon AWS? A new product or service is almost launched each week. It can get quite daunting to keep track of what is going on. The table below makes it easy to map the various cloud services against the big data warehouse architecture. I have also included a column that lists some open source components to make it easier to compare. Please note that this list is by no means exhaustive, as there are literally hundreds of open source tools that do similar things. I have just listed those that I have had some exposure to. Update: Due to popular requests I have added Oracle's cloud prducts to the mix. As a reference point and due to popular demand I have also added Hortonworks and MapR to the matrix. For Oracle I am only covering what is on offer in the Oracle cloud. Oracle has various on-premise solutions such as Oracle Stream Analytics, Oracle Enterprise Metadata Management (Catalog and Lineage), Oracle EDQ for data quality etc. that are not (yet?) offered in the cloud. Oracle has some unique products that none of the other vendors can offer. I am talking about Oracle Golden Gate and to some extent also Oracle Data Integrator. There is also Big Data Discovery. Download the full matrix that maps Oracle, Hortonworks, MapR, AWS, Azure, Google Cloud, Open Source to the Big Data Architecture (e-mail required). Dataiku DSS Community Edition (not open source) N/A Marketplace only, e.g. Dataiku DSS N/A Marketplace only, e.g. Dataiku DSS Cloud DataPrep (beta). Under the hood this is Trifacta.